The coefficient of inelastic backscattering electrons, η = iin/ii. Here, iin is the beam current of inelastic backscattering electrons and ii is the beam current of incident electron beam. The coefficient η depends on the energy (E0) of incident electron beam, angle of incident electron beam, chemical composition, and state of the irradiated sample’s surface. Figure 4813a shows dependence of coefficients of inelastic backscattering electrons on the energy of incident electron beam for Pb, Ti, and Al. Figure 4813a. Dependence of coefficients of inelastic backscattering electrons on the energy of incident electron beam for Pb, Ti, and Al. Single crystals are anisotropic with respect to the direction of moving electrons. During the electron motion along the channels of crystal structures formed by closely packed chains of atoms, the probability of electron scattering and atom ionization increases (so called channeling effect). In addition, electron diffraction in the crystal lattice is observed. 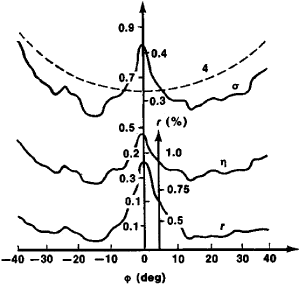 As a result of the two phenomena, the dependence of η(E0) on the angle of the incident electron beam has a complex shape, with several maxima and minima as shown in Figure 4813b). Furthermore, the coefficients of η usually given for polycrystals are usually averaged over various directions. Figure 4813b. Dependence of η on the angle (Φ) of incident electron beam for single silicon crystals at a voltage of 1 keV. Note that σ (overall electron emission coefficient) and r (coefficient of inelastic backscattering electrons) are discussed on the relevant pages of the book.